On the 11th, 12th and 13th of July 2008, the vintage sports car event ‘Le Mans Classic’ is to be held. 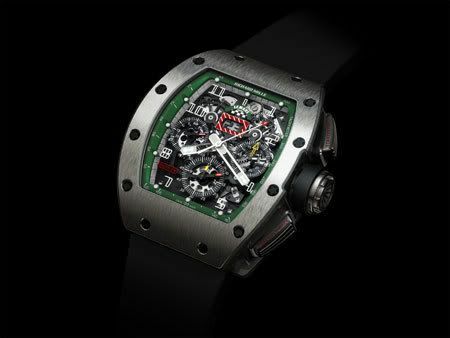 Richard Mille is the main sponsor of the event and is also the official time keeper. Especially for the Le Mans Classic 2008 event, RM created a Flyback Chronograph as pictured below. This is the RM 011 Flyback Chronograph watch, that should breathe the same atmosphere and style as the event itself. The green and white checkered logo at 12 o’clock marks this watch as being a special Le Mans Classic watch! The RM 011 features a skeletonized automatic, winding movement with adjustable rotor geometry with flyback chronograph in hours, minutes and seconds, 60-minute countdown timer, 12 hour totalizer, oversize date and month. The RM 011 flyback chronograph Le Mans Classic is available in a limited edition of 200 pieces. Of which 150 pieces are in full titanium and 50 pieces are in 18kt red gold/titanium.